Jimmy grew up fishing the river at his family cabin on the North Branch. A now lifelong Au Sable angler, he is familiar with the entire Au Sable in a way few are. 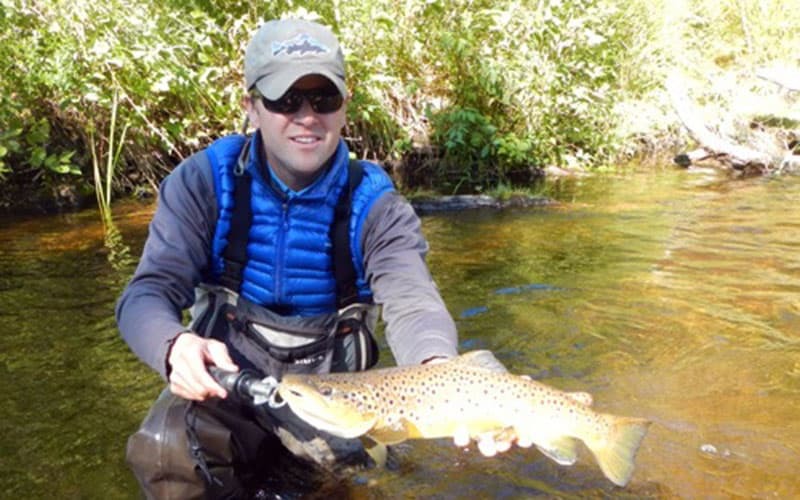 A dry-fly specialist, he is known for being one of the very best and most innovative guides on the river. He spends his winters tying flies you’ll only find in his box, and has a style that keeps clients coming back. His wife and kids live in a secluded home on the river. I was born and raised in Northern Michigan, and grew up near Lovells fishing Big Creek and the North Branch of the Au Sable. I started working for Gates Lodge when I was 19, and would come back north to work in the summers when I was off from college. The Au Sable is a great home river, and I can’t think of anyplace I have fished that offers the combination of gentle currents, gorgeous and unique scenery, and very challenging fish. My family moved to Grayiling in the early 90’s. I began guiding in 1997 after graduating high school. I had fished the AuSable and Manistee for most of my young life so the idea of guiding for a profession was appealing but never thought I would do it for a living. What began as a summer job, slowly flowed into a full time career. After love affairs with Alaska and Montana, working for several fly shops and a college degree, I decided to make guiding my profession and am grateful to be able to do it on my home water. I’ve had a fly rod in my hand as long as I can remember and I was lucky enough to have grown up two miles away from one of the premier fishing lodges in the Midwest. At the age of twelve I started washing dishes in the kitchen and I can still remember seeing the guides coming or going from the boat yard and I would say to myself “Someday that’s what I want to do”. Fly-fishing came very organic to me. When it came to “going fishing”, we just grabbed our fly rods and went. 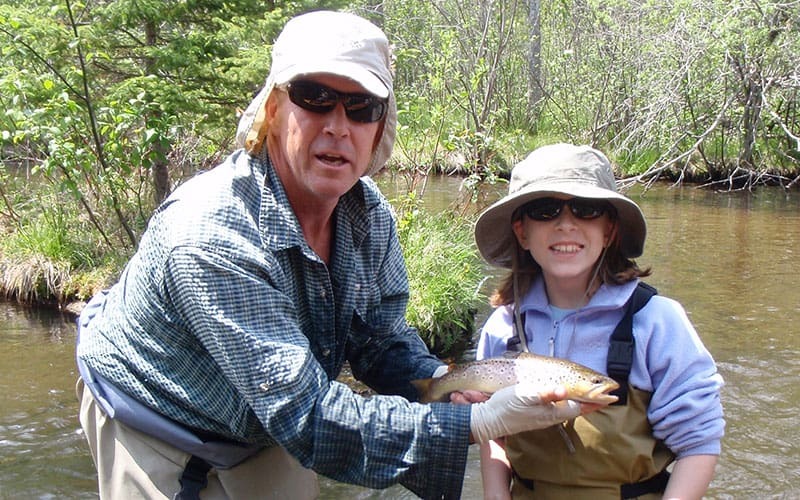 Mark started fishing the Au Sable & Manistee River systems in 1973. A six-time President of the Mason Griffith Founders Chapter of Trout Unlimited, he currently serves on the Board of Directors for that chapter as well as the Boards of Directors of the Anglers of the Au Sable, the Au Sable Watershed Restoration Committee and the Upper Manistee River Association. 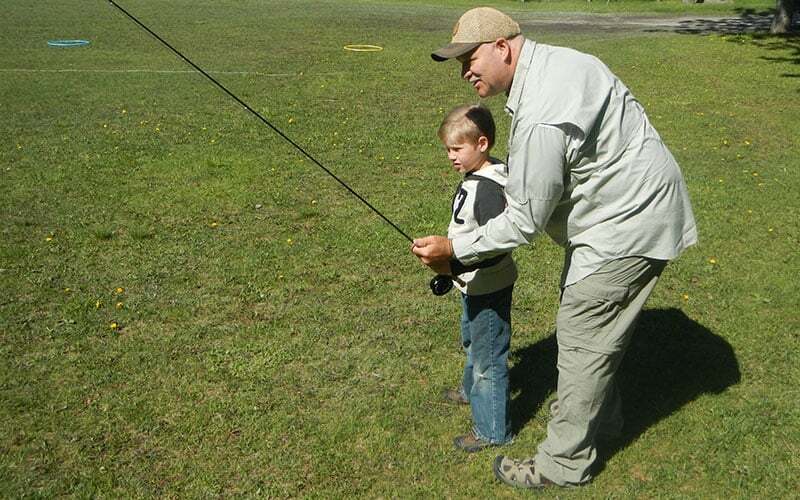 An FFF Certified Casting Instructor, since retiring in 2004 as Chief of a full-time Metro Detroit Fire Department he’s been working at Gates Au Sable Lodge as Head Instructor for all their fly fishing and casting schools as well as guiding on the days he’s not teaching. A “retired” shop rat, Jordan is born and raised on the Au Sable. A very talented and innovative fly-tyer, he takes that same creativity to the river. 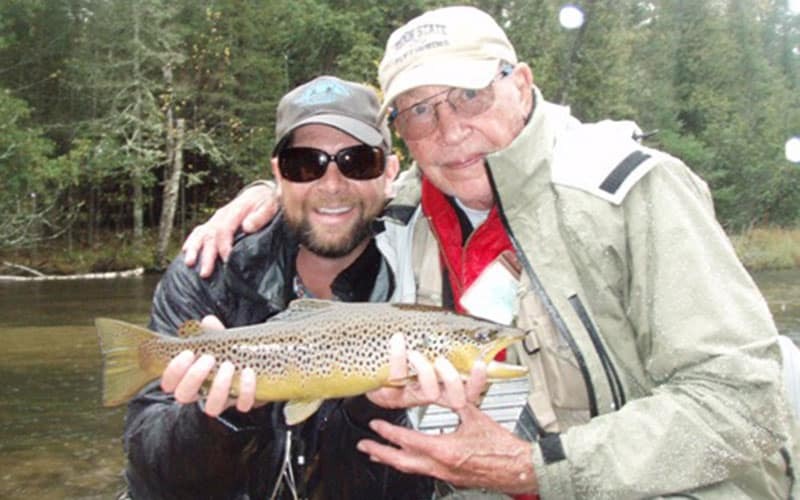 Whether it’s refining Czech nymphing to the Au Sable, or finding just the right dropper on a difficult summer day, he’s known for being one of the most enthusiastic and dedicated anglers, tyers and guides on the river. In the off-season, he is a (very) passionate ice fisher. I grew up in a small suburb about 30 miles south of Chicago. I began fishing at 2 years old in south central Wisconsin while staying at my Grandparents lake house. By the age of 11 I picked up a fly rod and never put it down. I knew it would always be a huge part of my life. After college and a few corporate jobs, I knew sitting behind a desk wasn’t for me. I realized that I loved sharing my passion with others, providing instruction and working outdoors. I enjoy fishing on the Au Sable because it can be challenging. 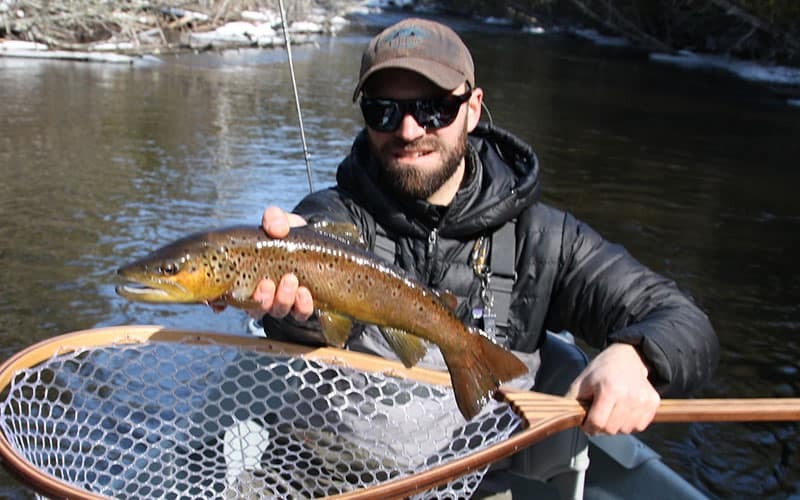 Alex Lafkas will be teaching a variety of schools at Gates Lodge in 2016, as well as offering guide trips that will take anglers on new Michigan experiences…even if in familiar water. Alex has been at the forefront of Au Sable angling for two decades. He has designed countless flies, developed out-of-the-box techniques and strategies, and has spent thousands of hours on the water pursuing everything from White River brown trout to North Branch brookies. Anglers should bring layered clothing, rain gear, and appropriate rod and reel outfits. Our boats can easily carry extra equipment. We supply flies, leaders and tippet. Rental waders and equipment are available. Please contact the lodge if you have any questions regarding our trips. We put special effort toward making your guide trip with us the best that it can be, whether it be tailoring a float to a particular request, or matching you up with the proper guide, we’ll go the extra mile here so you have a better experience out there. Usually by April 15, we mix our streamer fishing with what the Au Sable is most known for: hatches and rising trout! This is our specialty, and what many anglers think of when they think of the Au Sable. 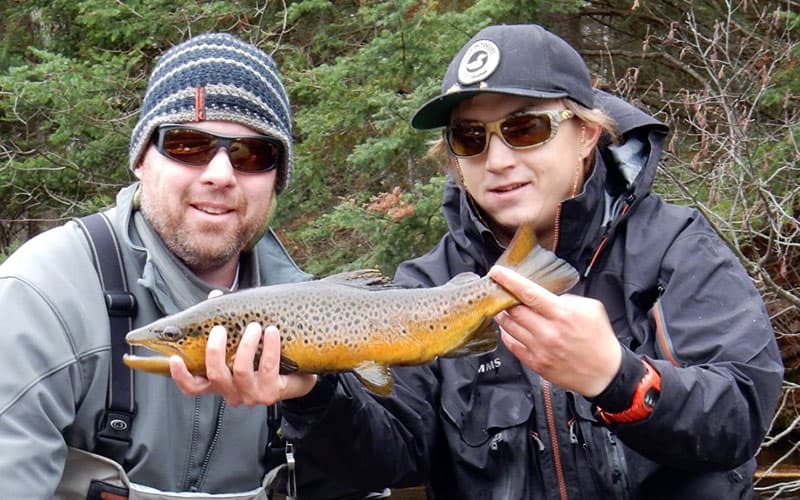 Our guides are some of the best dry-fly guys in the state. As the spring warms up, the bugs begin hatching earlier and later in the day. By May 1, we’re in match the hatch mode. A dry-fly trip on May 1 may leave at 10 am. By June 1, it’s 2 pm. And by the end of June, we may be leaving at 4 pm or later and casting at rising trout at midnight. By July 10th, we’re back to chasing morning bugs. With the start of the July BWOs and tricos, are fishing turns toward the small bugs, and the big terrestrials. While the tricos can be maddening, the BWOs offer sulphur-quality fishing with a fraction of the anglers. We love this time of year and believe it the most underrated, offering perhaps the best all-around dry fly fishing of the entire season. The trout we catch are smaller through the middle of the day, but good fish are caught…especially for those that stay into the evening rise. No region has more night fishing associated with it as the Au Sable/Manistee area. We recommend our half day option, and we’ll meet after dinner and take you deep into the night, flinging a variety of big bugs imitating mice, frogs, moths and some creatures more mythological in nature. This is trophy hunting…some of the finest of the year, in fact. We like the dark nights the best. Expect to start at 8-9 pm. Includes snack and drinks. 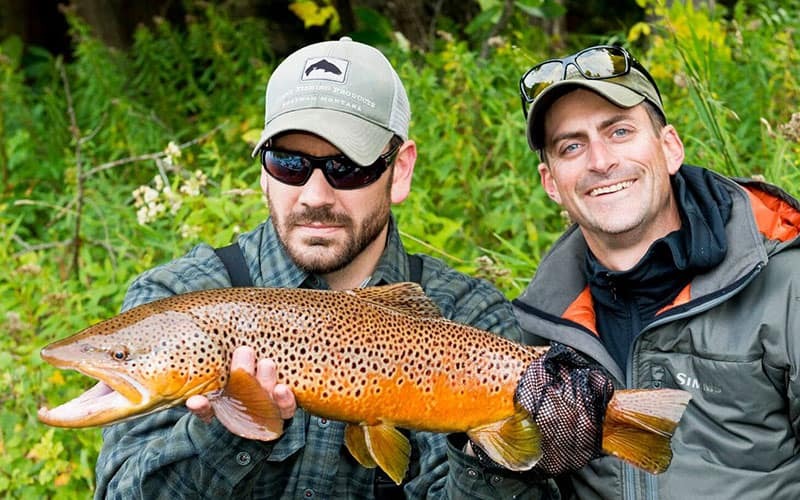 From August through November, we fish the pre and post-spawn stages of the brook and brown trout. This is some of the finest brook trout fishing of the year, and the brown trout fishing isn’t too shabby either. The rivers are low and clear and beautiful. The leaves are turning. And the fish are chasing small and easy-to-cast streamers, or rising to BWOs. The finest in scenery, and the finest in trout colors. Come late October and through the end of November, we’re chasing big browns, preferably the hungry post-spawn browns that are feeding like crazy before the winter settles in. This can be brutal fishing. It can be great fishing as well. 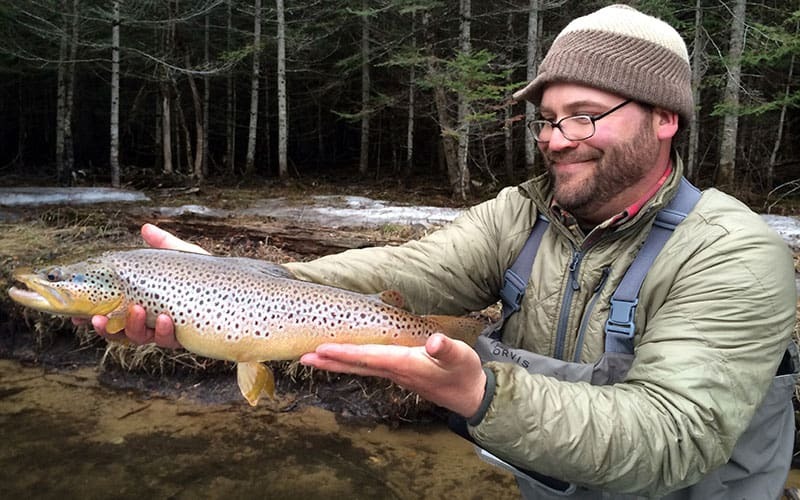 And it is the perfect bookend to our season, offering comparable fishing to March and April…that is, the chance at the largest trout swimming in the Au Sable and Manistee Rivers. Please fill out the form below, or call us at 989-348-8462 for immediate assistance. What fishing day(s) are you inquiring about? Do you have a guide preference?